When bass are feeding on baitfish a fluke style bait is impossible to ignore. 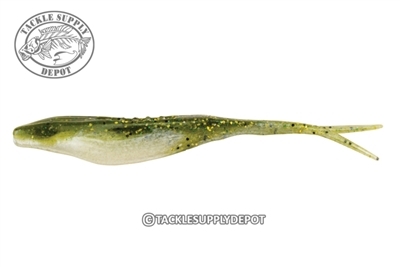 The Berkley Powerbait Jerk Shad is a deadly soft jerkbait that allows anglers to cover what with ease as well as is designed with Berkley's Powerbait scent formula that makes fish hold longer than other brands on the market. Fish on an EWG hook as a jerkbait around cover and over flats, match with an underspin head when fish are holding deeper or drag on a Carolina rig; the Jerk Shad is super versatile and able to cover multiple situations.